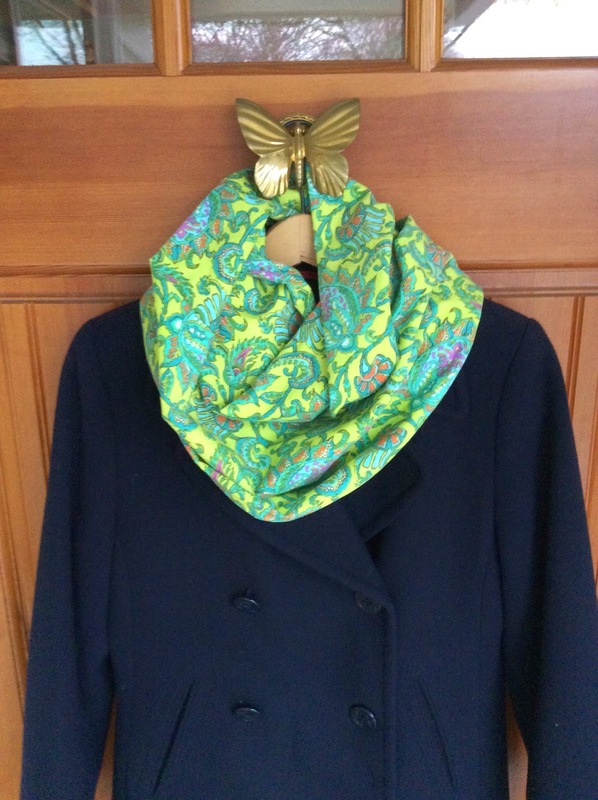 Today my friend Stephanie over at Rummage posted a new infinity scarf made from her tutorial that can be found HERE. I liked the scarf so much that I had to run right down to my LQS, buy some corduroy and make one! I knew my LQS had a bolt of Soul Blossoms 21-wale corduroy and was hoping it was still there. Not only was it still there, it was 50% off! Score! I can't tell you how soft and warm this scarf is! I can't wait to wear it out! Check me out on Instagram as well: mrssquash. Stephanie has written a book called Uncommonly Corduroy. It has lots of great patterns that can be made from corduroy (or not). I urge you to make at least one item from corduroy! This scarf is a great starter. Once you work with it you'll find how similar it is to working with flannel - soft, warm and easy peasy! You can find her book HERE. Mr Squash got a box today. It was full of these as well as Tastykake pies. 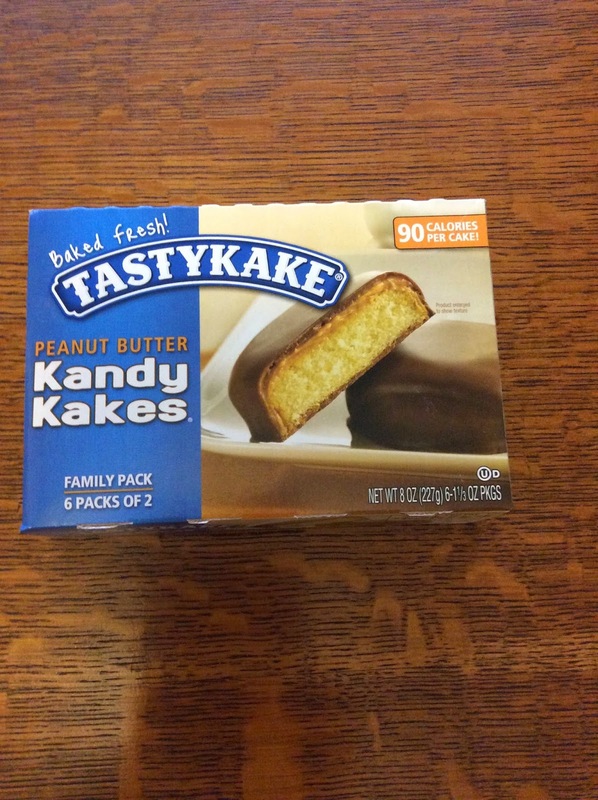 He grew up with TastyKakes and covets them! They aren't available here on the West Coast - nor had I ever heard of them until we met. Fortunately his sister knows how much he loves them and sent a box along for Thanksgiving! Thanks, Barbara! Corduroy Road - A Supreme Reveal! 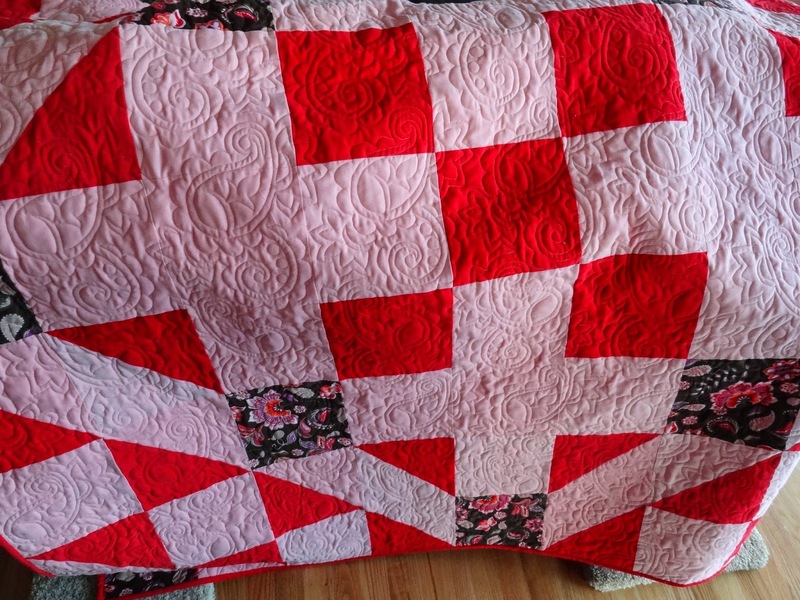 This past winter I had the joy of testing another quilt pattern for my friend Stephanie over at Rummage. As many of you know, Stephanie has a variety of people test her bag and quilt patterns prior to publication, She calls us her "Supremes". As soon as she showed me the prototype I immediately knew what I was going to do with this very special quilt! You can read all about the particulars of this quilt HERE. It is also currently available as a pattern from Connecting Threads. I've tested many bag patterns for Stephanie using one of her favorite mediums, corduroy. This was the first quilt I made using corduroy. I must say I was a bit afraid of it at first, but only because I had never made an entire quilt using corduroy. Let me say, my fears were unfounded! Corduroy has now become the new flannel for me! It's easy to work with, puts less lint in your machine, and gives wonderful dimension to your projects! I really encourage you to give it a try! On to the quilt! 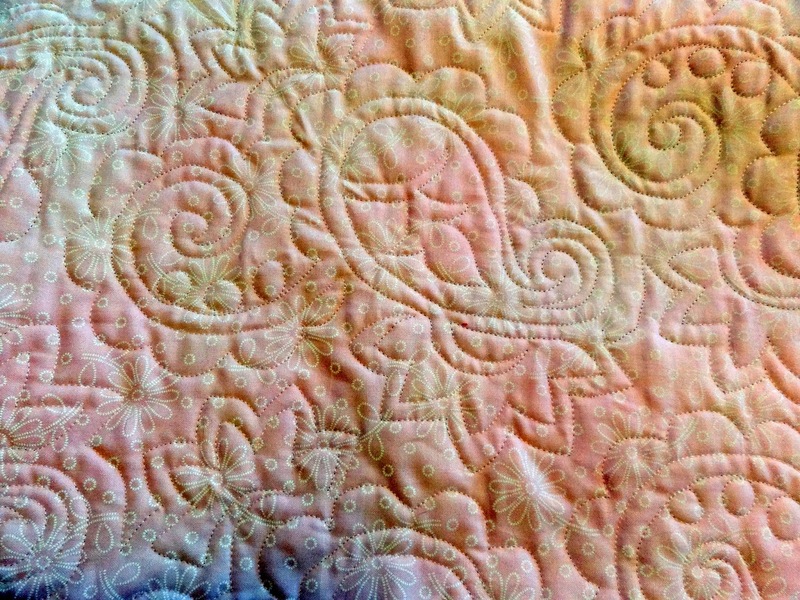 I knew that I wanted to make this quilt for my dear blogging friend, Pratima, whose blog is Lakumuki. Pratima and her husband, Kalyan, hail from Hyderabad in South India, although they currently live in the U.S. Mr. Squash spent some time in India and Nepal and still remembers a good deal of the Hindi language. We have enjoyed our blogging friendship and hope to meet in person some day! Pratima and her husband celebrate the Hindu Festival of Diwali, or Festival of Lights each year. I picked the bright colors in the quilt to reflect my own interpretation of that colorful celebration. Mr. Squash helped me pick the quilting design, which is aptly called "New Delhi". The paisleys in the pattern can be found in many Indian prints. 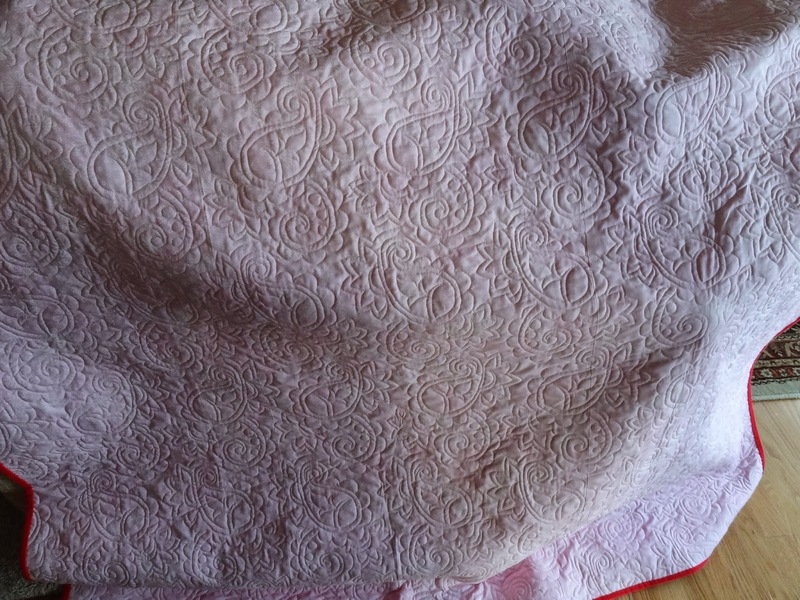 I used a cotton batting from my stash because of the coordinating light pink color. 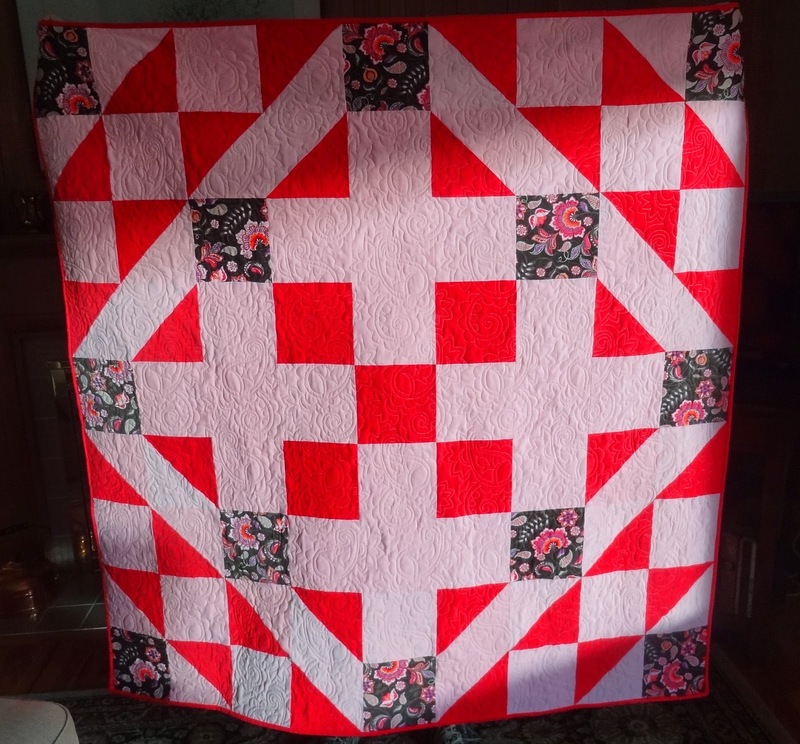 It really shows off my quilting. Believe me when I say this is a most warm and cozy quilt! Here is a closeup. The color is a bit off, but you can see the embellished paisley. I encourage you to make a quilt using Corduroy! If you need inspiration, Stephanie has written a book called Uncommonly Corduroy with lots of bag and quilt patterns. Pratima is also posting about this quilt today. Please visit her blog Lakumuki. I'm sure she will tell a lovely story as she always does! 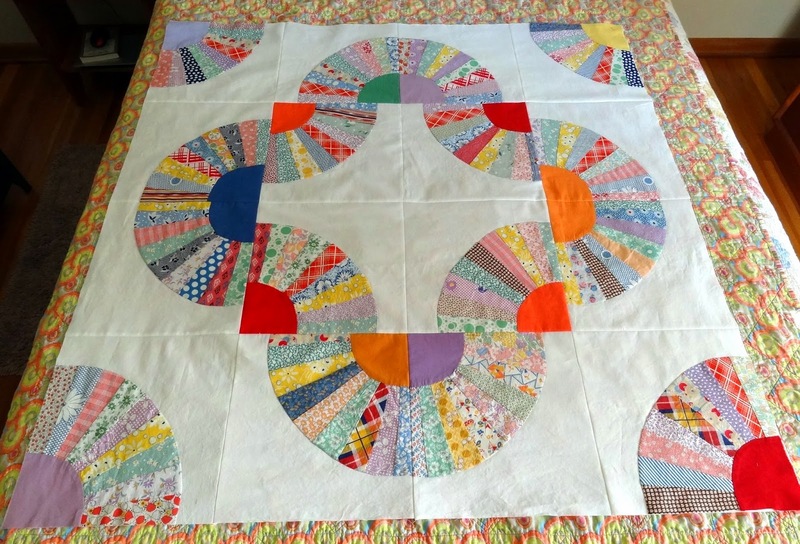 Vintage Block Returns as New Quilt! Before I forget, if you're looking for me these days I'm over on Instagram as mrssquash more often than here (obviously). I'm actually enjoying the beauty of snapping a photo and instantly posting it. Never did I ever think that the "instant" way of doing things would be for me, but for some reason this just clicks. Don't hesitate to give it a try! A while back I mentioned that a dear friend shared some vintage fan blocks with me. I immediately fell in love with them and wanted to give them a new life as soon as possible. Most were hand stitched and most were already made into blocks, but some were not. So, I decided to give them a good wash and make new setting blocks for all of them. This was not a task without issue, but I love the result! Here is the finished top - so far. I still need to figure out a backing and binding. I have no idea when the original fans were made - could have been 40's, 50's or even as recents as the 70's. It seems some of the prints are older than others, but they all play together so well! As I mentioned above, this project was not without a few "issues". Here you can see that two centers are quite a bit off. I had to do a lot of trimming to get them all approximately the same size, and I knew here and there I would face something like this. Since this was the most obvious miss match, I'm really not worried about the quilt police coming after me. This section fits much better as does the remainder of the quilt. I'm trying to decide whether to bind it using a new print or solid. Any suggestions are most welcome! Autumn never disappoints in our neck of the woods. This year our fairly new maples in the backyard are not playing well together. The one on the right is taking it's sweet time changing colors. We don't mind as we just get more color later than usual! 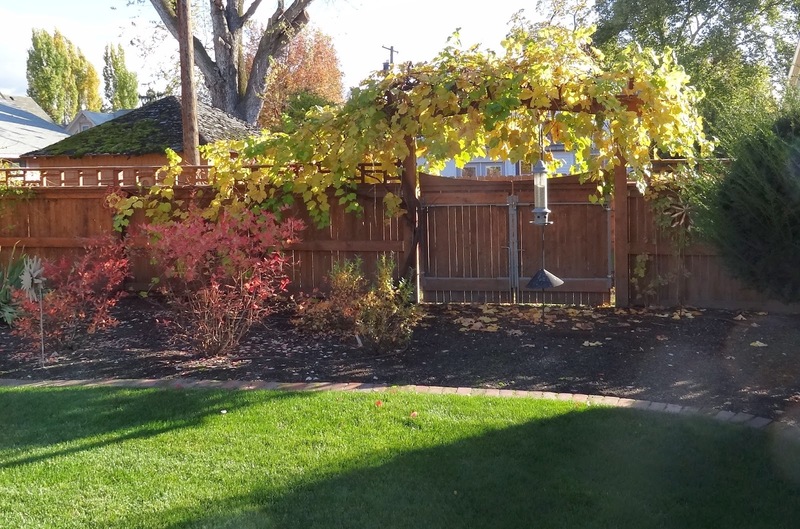 The grape arbor is always so pretty just before the leaves begin to fall. Yesterday Mr. Squash had his annual Polish Leaf Picking Festival. If you click on the photo you can see the leaves in the street ready to be picked up by the city. He'll start all over again when the dogwoods are finished shedding their gorgeous red leaves. Don't forget to stop and see me as mrssquash on Instagram!